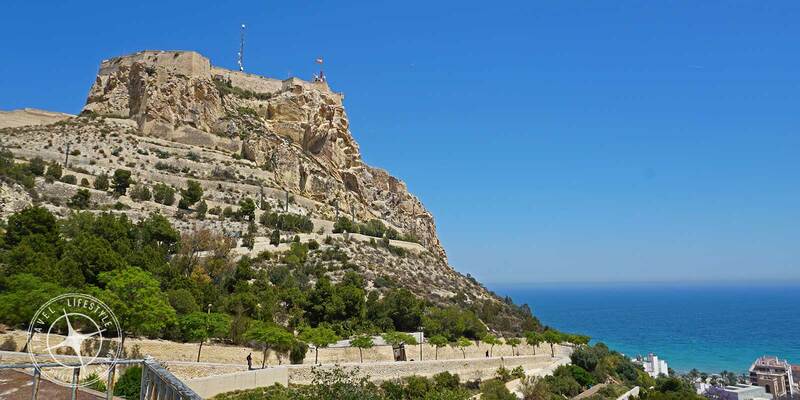 I have to admit – my first impression of the Spanish Mediterranean city of Alicante, was not super great. But (and yes, it’s a big ‘but’), my mind has been changed after my recent second visit. I feel I experienced a more well-rounded introduction to this castle-adorned and history-rich port-city. And it didn’t take a long visit. It was Eric’s first time and we went for only 2 days, 1 night. On this trip we really enjoyed Alicante and look forward to returning for more visits and would take family and friends when they visit us in Spain. 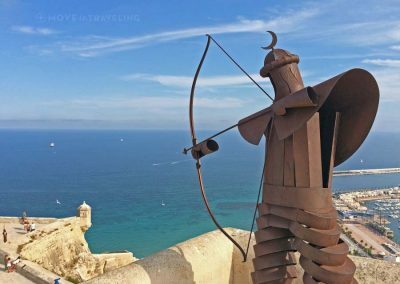 Whether you’re visiting for a short or long trip, here are three things to see and do in Alicante so you can experience its history, shopping and food. 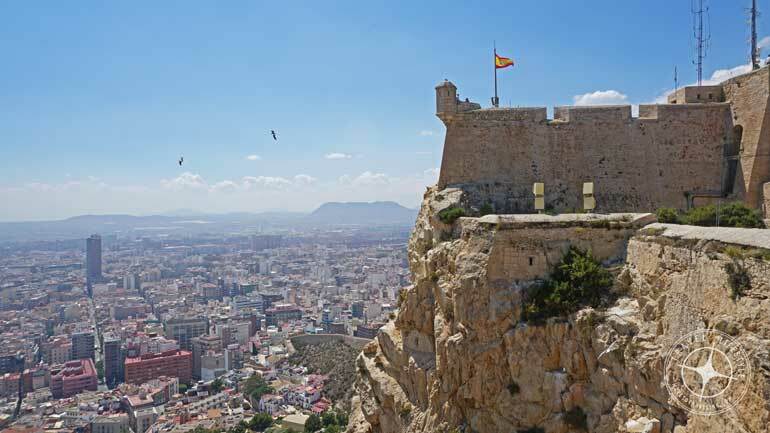 Alicante’s Castle of Santa Barbara is an impressive, historical structure that sits as the highest point of the city. 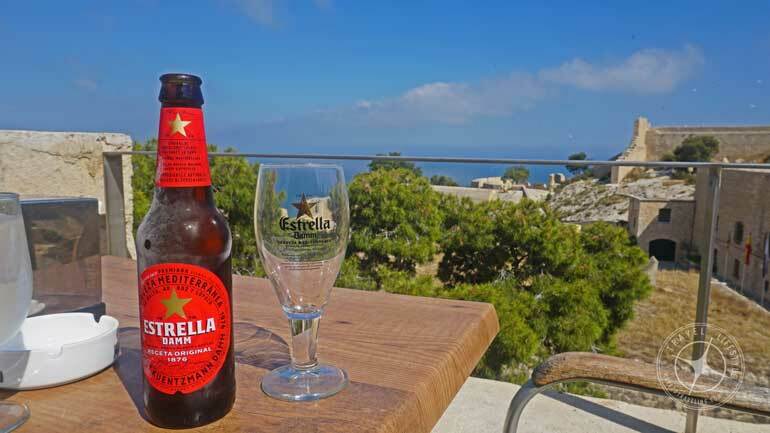 Located on the dramatic hilltop of Mount Benacantil, it’s right along the popular El Postiguet beach and only steps away from the marina of Alicante. Up on top, you get spectacular views from the countless vantage points throughout the castle. Entry is free and there is an optional elevator for getting to the top, which cost only 2.70€. The entrance for this lift is on the castle’s seaside and right across from El Postiquet beach. You also have the free options of driving up from the back side of the hill (opposite the seaside) or walking up, which is what we did. The walk is fantastic and we highly recommend it. On the south-western side of the castle, there are two paralleling routes that you can take. These both start from the Ereta Park, a lovely open-air space with a restaurant and great views of the sea and Alicante’s old-quarter. It’s a steady, uphill walk of about 10 – 15 minutes. The path we would recommend the most is the one along top one of the remaining fortress walls. But you can do both, one on the way up and the other on the way down. Our visit was in late May and it was beautiful, sunny weather, yet already quite warm. The routes have very little to no shade, so if you’re going to walk up in hot weather, be prepared. Once on top, you truly get an idea for how large and expansive the castle is. It spreads out in three areas that are distinct to its three eras throughout history. The upper enclosure features “La Torreta” which is the keep and dates back to the 14th century. Today it also houses the most ancient remains exhibited in the castle. 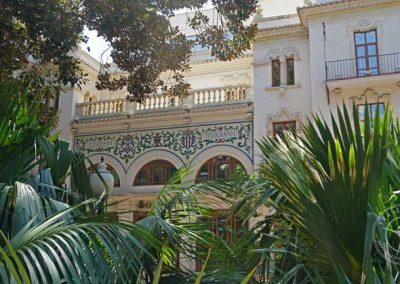 We especially enjoyed the ongoing exhibit of Alicante’s 19th-century history, featuring the people of Alicante through in black and white photography and the coat of arms of some of the long-time families of the city. The mid-level enclosure is home to the Salón Felipe II, the Cuerpo de Guardia guardhouse, and the Patio de Armas parade ground. These are considered to be the most important buildings of the castle’s history and were built in the 16th century. 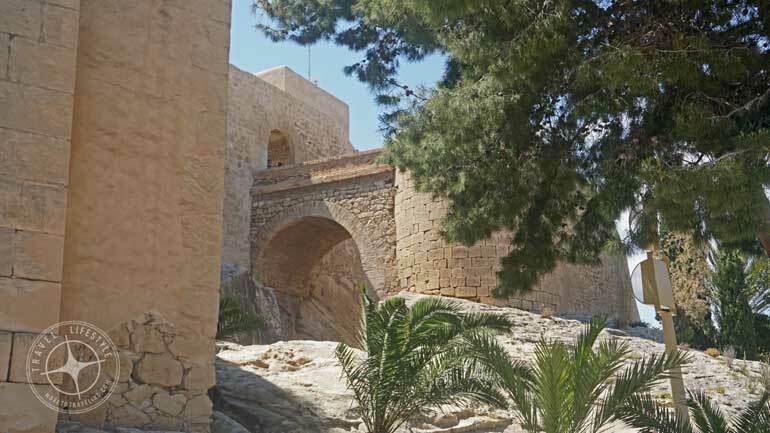 The castle’s history is fascinating, with its origins date back to the 9th century when the Iberian Peninsula was under Muslim control. From there it underwent attacks, reconstructions and even abandonment as Spain has undergone the tumultuousness of monarchies, civil wars, and economic crises. Make sure you take time to relax in the castle by stopping for a drink and maybe a tapa at the Cafeteria that is in the lower enclosure. There is also a refreshment stand and cafe tables in the upper enclosure and near where the lift drops off. 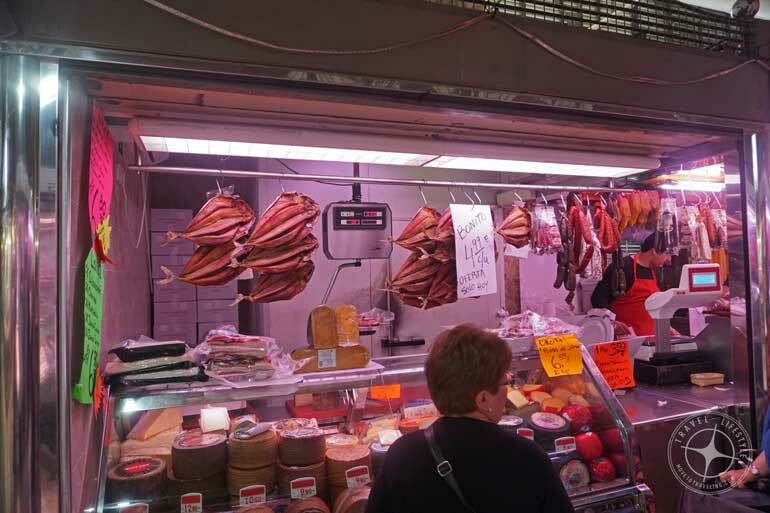 One of our favorite things about Spain is that every town, city, even villages, have a central market. And in our mind, they’re a must-see for experiencing the local people and culture in Spain. 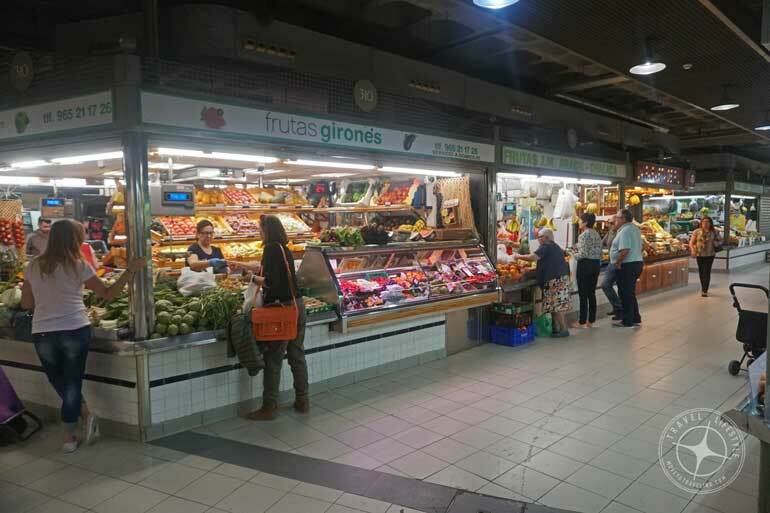 Alicante’s central market is also referred to as the Mercado de Abastos. For the purposes of this post, it can be considered for each type of site – history, shopping and food. Yet we’ll focus on it as a great place to shop when you are in Alicante. After all, far better than just the typical shops you can visit in any other city. 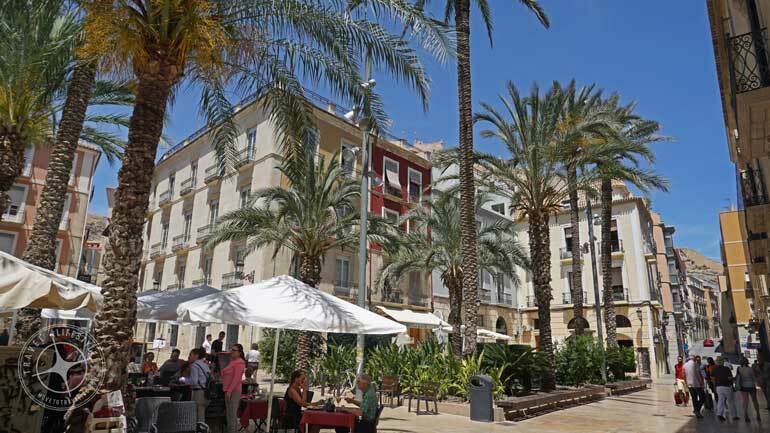 If you do want / need to do some other shopping while in Alicante, go to the Avenida Maisonnave. There are shops all along there and on the corner of that street and Avenida Federico Soto is a Cortes Inglés shopping mall. 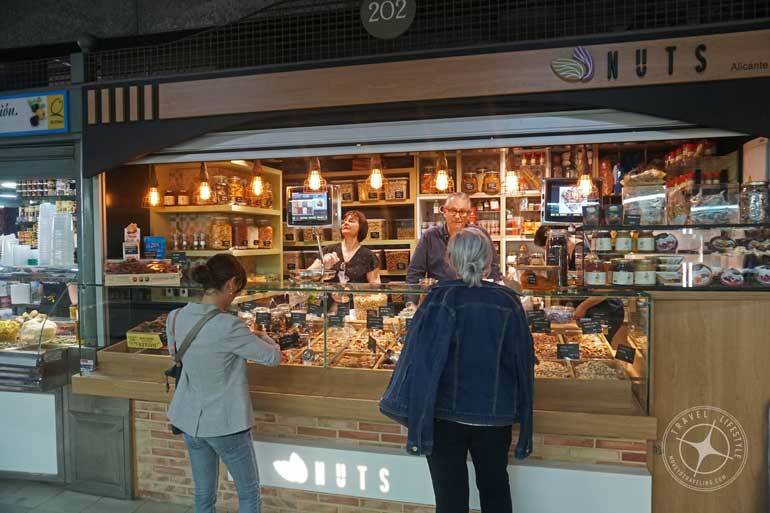 Here you can get the local produce and products from local vendors, whether it’s to take back to the hotel, snack on while perusing the stalls, or for a picnic lunch on the beach. It’s also a feast for the other senses. The array of vibrant colors and the smells will have you looking in every direction and wanting to stroll every aisle. 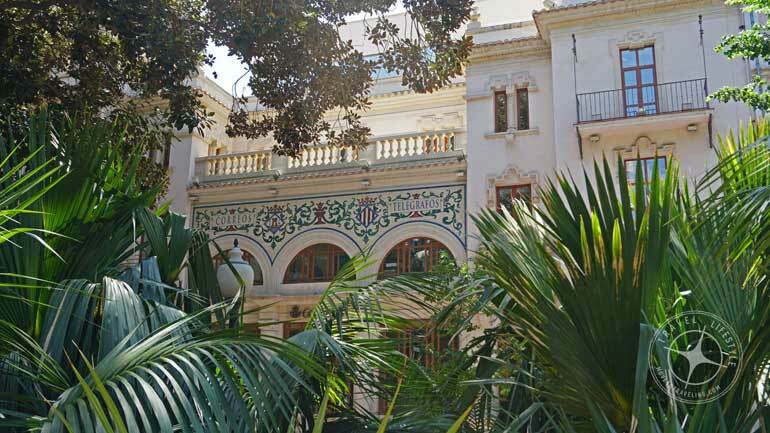 The building is one of the city’s noted architectural sites as well, with traditional colorful tiles adoring its walls and entranceways. A major historical fact is that on May 25, 1938, the Mercado de Abastos was bombed and more than 300 civilians perished. This was during the Spanish Civil War (1936 – 1939) and the city of Alicante was the last city loyal to the Republican government, undergoing horrible air attacks of which this was the worst. Today the market is bigger than it seems from the outside. There are two floors, one of which is below ground. 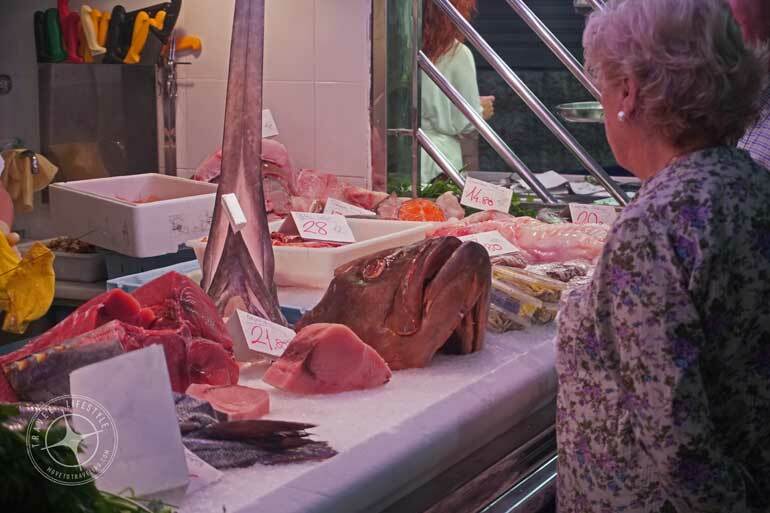 There are also cafes and bars where you can get a drink and bite to eat or even have your just-purchased fresh fish cooked for you to eat on the spot. Once heading out, make sure to go out from the opposite side you of where you entered, so you can appreciate the different entrances, like the flower vendors at the north side of the building. We were recommended the Restaurant Plaza Canalla and almost didn’t go because of some mixed reviews we saw online. It goes to show, don’t believe all the reviews you see. We’re so glad that we tried it for ourselves. The restaurant is beautiful inside, but the highlight is its great outdoor seating along one side of the splendid Plaza Canalla. It was the ideal place to sit in the shade of majestically tall trees full of dark green leaves, trellising flowers and lush green palms. 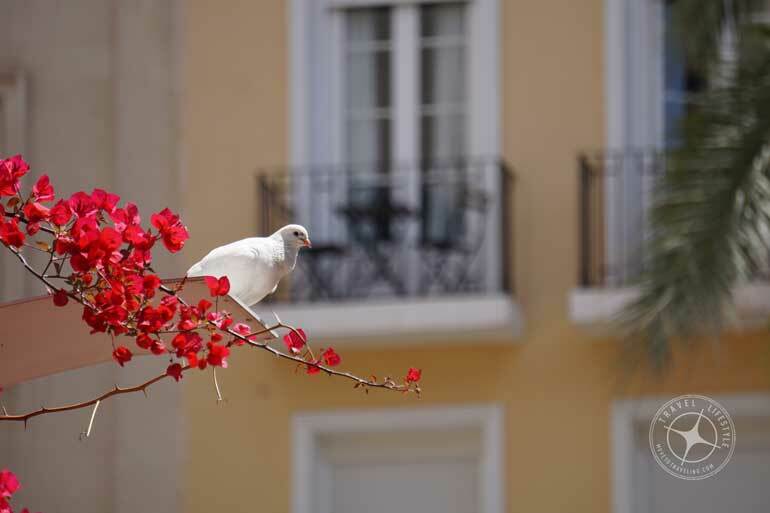 With the surrounding buildings of beautiful Spanish Baroque architecture, there is a feeling of tropical meets Europe. The plaza also has a large water fountain in its middle with a statue, which can be heard and seen from the restaurant’s seating. We had lunch at Restaurant Plaza Canalla and enjoyed great service. Our server was attentive and was very helpful when asked for his recommendations on both beers and dishes. We really enjoy that in a restaurant experience because for us it makes it more personable and can provide local insight we would have otherwise missed out on. The menu exhibited some creative spins on traditional Spanish dishes and they use fresh, seasonal products. Their menu varies according to what is in season, another favorite restaurant practice of our’s. Everything looked so good that it was hard to choose, yet we finally decided. Para beer (to drink), we both decided on beer since it was such a nice, warm day outside. That and we are big fans of artisan, craft beers. 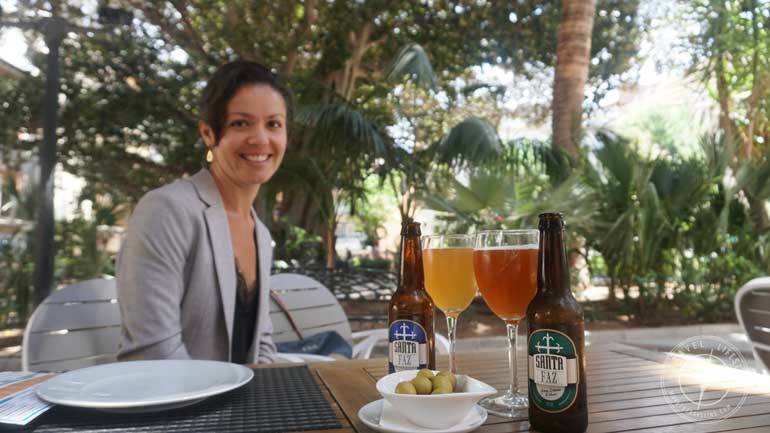 When asked about their beer selection, our server recommended a local craft beer company called Santa Faz. We had their ‘Rubia’, or blonde, and their IPA. Both were exceptionally good. So good, we had two rounds. 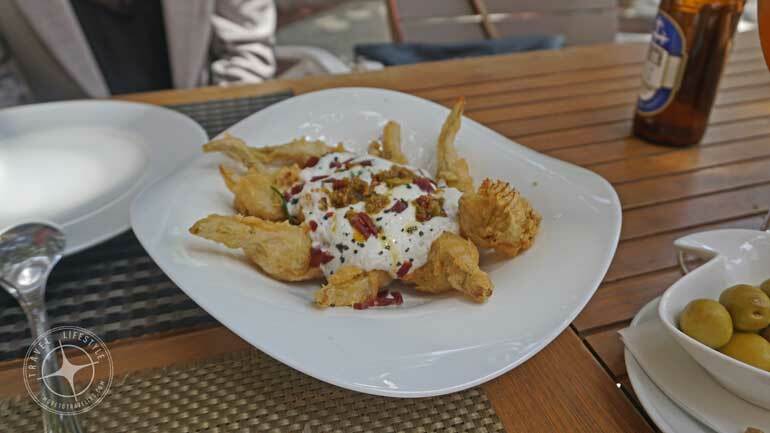 Our starter was tempura battered artichokes with parmesan foam, teriyaki sauce, and bits of crispy Iberian ham. It was one of the best artichoke dishes we have ever had. 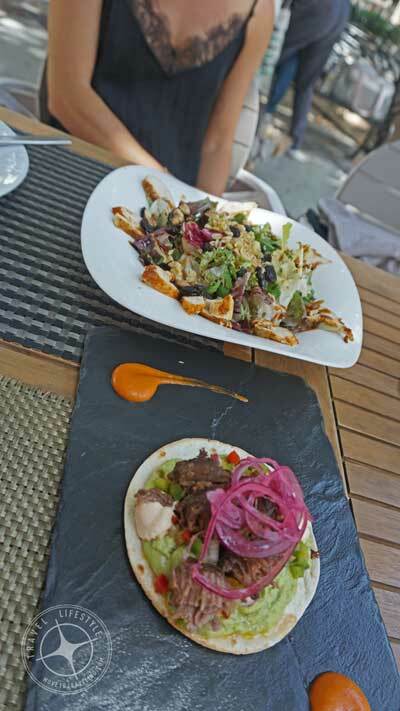 Then we shared one of their speciality entree salads called the Gabriel Miró Ensalada. It was beautifully composed of fresh, mixed greens, tender wheat, raisins, and Thai seasoned chicken breast. Another small entree we shared was one of their tacos, called the Taco Pibil. It’s feature ingredient is ‘carrillada de cerdo’ or pig cheek, slow cooked at a low temperature. This particular cut of pork is delicious in Spain and Restaurant Plaza Canalla did an especially great job with its flavors and texture. It was garnished generously with guacamole and red onion. Everything from the atmosphere and location, the service, food quality and tastes, were a fantastic experience at Restaurant Plaza Canalla. We look forward to returning when next in Alicante. Alicante is a fantastic city to walk around. 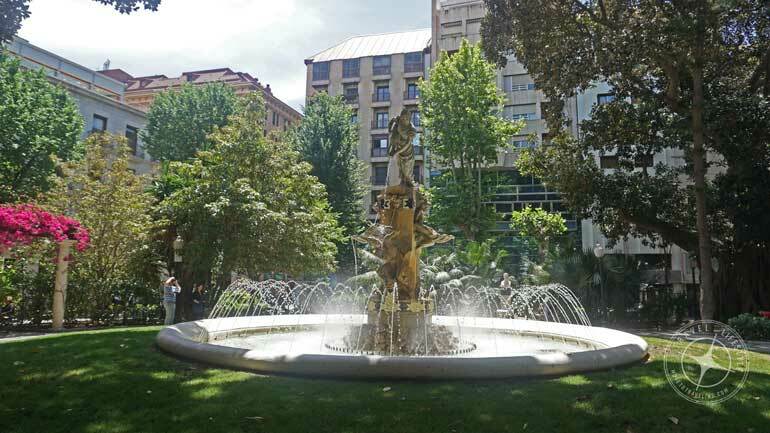 They are especially famous for the ‘Explanada de España’, also referred to as the ‘Paseo de la Explanada’. This wide promenade parallels the port and is beautifully decorated with flowers, palm trees, and sitting areas. The main feature is its marble-tiled mosaic floor that forms a tricolor wave design. 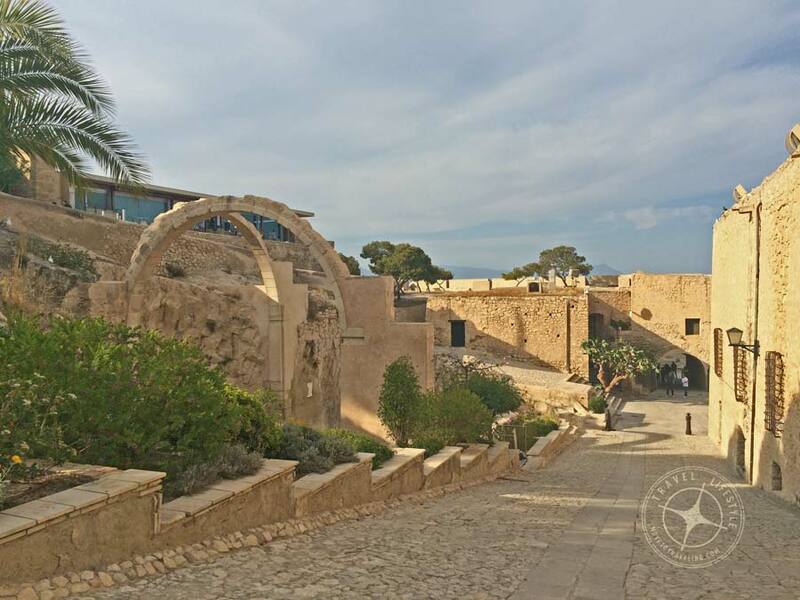 Here you can enjoy cafes, little hippy shacks, and simply strolling the promenade. Other great things to enjoy in Alicante are its marina, full of restaurants and great to charter a sailboat from, the beaches of course, and various museums. The MARQ Archeological Museum was awarded Best European Museum of 2004 and is known for being the first archeological museum of the 21st century. 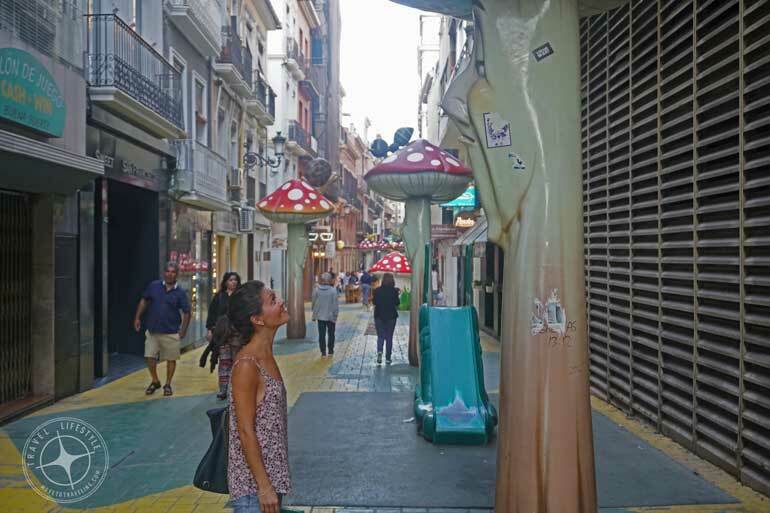 A little unexpected discovery we made was the Calle San Francisco, also known as the Calle de las Setas. 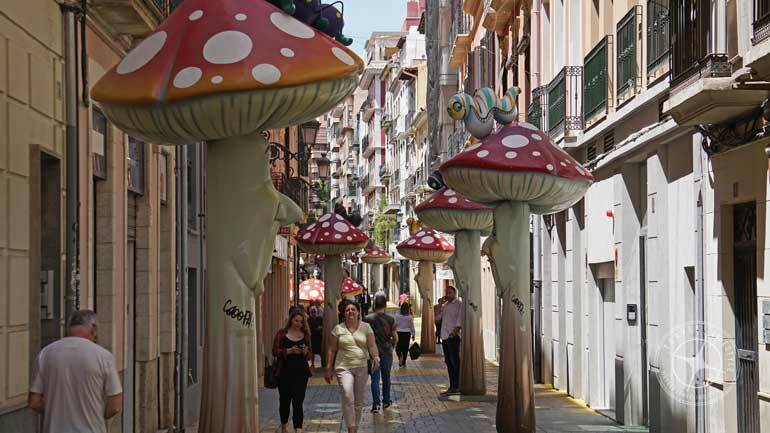 This small pedestrian street in the center is decorated with large figurines of mushroom people, toadstools and cute bugs. Yes, that’s what I said – mushroom people. There’s also the occasional slide and various places of hopscotch painted on the ground. It was creative and charming to walk along. And while it’s supposedly meant for children, it’s presence shows that Alicante appreciates being a child at heart. After all, it’s also lined with trendy restaurants, boutique stores and ice cream shops. 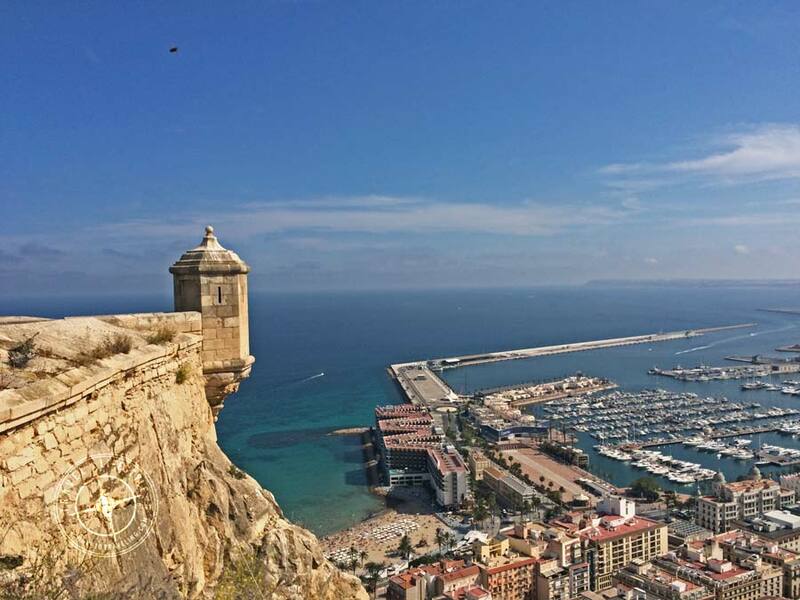 What is great is that to get to all these wonderful things to see and do in Alicante, there is a wonderful airport to fly into. The Alicante-Elche Airport is actually the fifth busiest airport in Spain, even over the Valencia Airport. Getting to Alicante especially from within Spain and Europe, has become more and more convenient. Hasta la Proxima Alicante – Till Next Time! 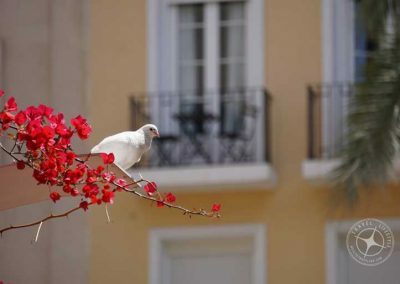 Even during a short visit, it’s easy to have a great time in Alicante. We feel that it is a lesser-known Spanish city among a lot of travelers to Spain, which to us is part of the appeal. 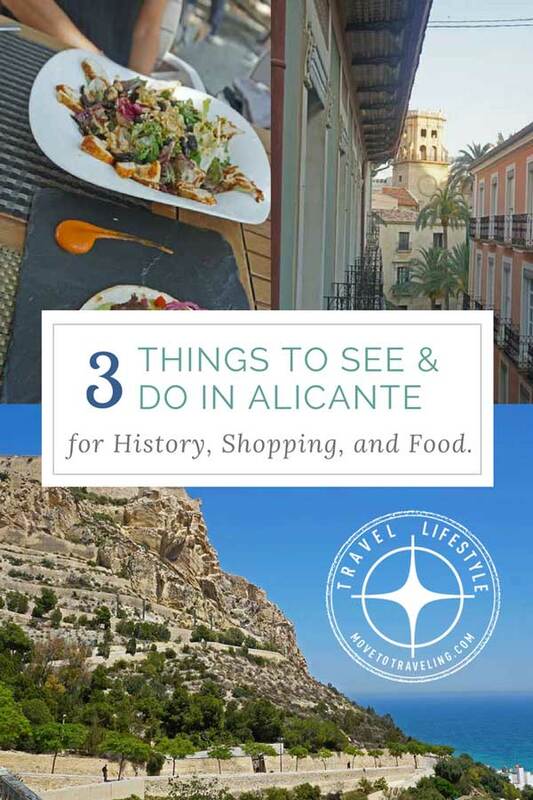 We’ve highlighted these three things to do and see in Alicante because they introduce some of the many great characteristics of the city and will have you coming back for more. This is one of the hidden charm of Spain that Europeans missed a lot. Agreed Eric. 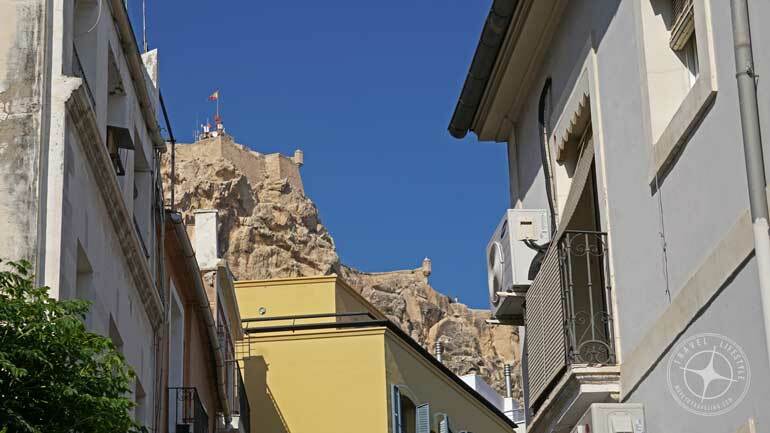 We had never heard of Alicante before moving to Spain, and now are so glad that it is near where we live on the coast. It is a hidden gem for sure. Thank you for reading and commenting!